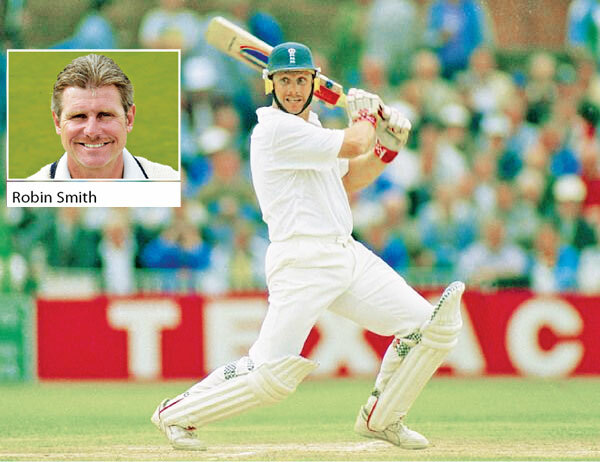 Robin Smith was arguably the most dynamic and exciting member of a fragile England top order of the early and mid-1990s. In 62 Tests, the right-hander scored more than 4,000 runs at an average of 43.67, among the highest of any contemporary England player. But South Africa-born Smith’s rise as a swashbuckling, stroke-making number five was perhaps as rapid as his fall from the international stage. Now living in Australia, the 54-year-old former Hampshire captain has faced new battles off the pitch. “When the bubble bursts as a professional sportsman, if you haven’t prepared for life after, you’re in serious trouble,” he told BBC Radio Solent. Mental problems and anxiety forced Smith into a more reclusive life since retiring in 2003. Now he is channelling his experiences into a degree in psychological science at Swinburne University, Melbourne. “When we were playing, we weren’t encouraged to pursue thoughts or careers outside the game,” he said. “I was criticised by [then England coach and chairman of selectors] Keith Fletcher and Ray Illingworth for having too many fingers in too many pies. “It’s different now with the work the Professional Cricketers’ Association do, but it was very difficult then. “I would love to become a psychologist once I’ve qualified in about three-and-a-half years. It’s such a deep process trying to get over professional sport. Smith approached the England selectors in the early 1990s about having a sports psychologist in the squad, but his suggestion was declined. “There were a lot of England players who I believe would’ve become better had there been a psychologist within our midst,” he said. “You just have to look back at Mike Brearley as an England captain, who was just fantastic. Mike wasn’t even close to being in the best XI in England, but he rallied the troops and brought out their best performances. Despite Smith’s eye-catching ability at Test level to dispatch some of the most fearsomely quick bowlers with a flourishing cut or pull shot, it was his struggles against spin that finally led to him being dropped by England in 1996.Shane Warne, later a Hampshire team-mate, was among his chief tormentors. “I started losing my confidence because I started listening and believing the press and what they had to say about my inadequacies against spin bowling,” Smith said. On song, Smith’s most destructive innings against pace included an unbeaten 167 off 163 balls against Australia at Edgbaston in an ODI in 1993. That knock stood as the highest individual score by an England batsman in limited-overs cricket until Alex Hales surpassed it with 171 against Pakistan in 2016.